Have you been working with some old tools and got rust on your clothing? Or maybe you went for a hay ride, like I did, and sat on a rusty nail that left a horrible rust stain on my jeans! Well this will get that rust stain out of your clothing… or most fabrics for that matter! 1. 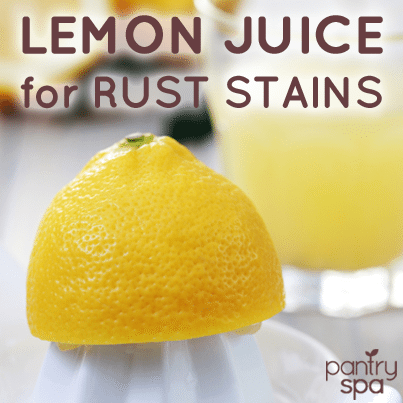 Squeeze some lemon juice onto the stain. 2. Let the lemon sit on the fabric for at least 10 minutes. 3. Wash the area in the sink with some detergent and rub the area. 4. If the stain has not come out fully, let the fabric dry and repeat the above. 5. Wash your clothing / fabric as usual.